I love my wife, like big time. Recently I have been investigating her eating habits during the week. She’s extremely disciplined when it comes to lunch and snacks during the work week. Me on the other hand, well, I typically rock out an egg with a Thai chili, then I make a mixed berry smoothie for breakfast. My lunch is a gamble where I typically bring in a small bowl of leftovers, or get easily persuaded to head out to lunch with my colleagues. Dinner, well, it’s whatever I can play rock and roll cook before everyone gets out of control hungry. But my wife, man, she is pretty good. She will pack a few almonds, some carrots, an avocado, a small salad, and some fruit. That’s great stuff, so with that said, I wanted to make her something I knew, or at least I thought should would like, for a nice afternoon snack. One that would fill her up and keep her moving with some good energy throughout the day. This is where the avocado deviled egg comes into action. Begin by adding the eggs to a large pot of cool water. Bring to boil. Once boiling, cover and removed from the heat. Keep covered for 13 minutes. During this time, fill a large bowl with water and add about a cup of ice. Remove the eggs with a slotted spoon and place them into the ice water to quickly cool. Take an egg out, and gently tap the egg on the counter, just lightly cracking the shell. Carefully remove the shell from the egg. It should peel right off. Repeat with the other egg. Next, with a long and sharp knife, slice the egg in half, lengthwise. To another bowl, add in the diced avocado, and season with salt. Add the cooked egg yolks from each of the eggs, and place the cooked egg whites onto a plate. Mash the avocado and egg yolks until you have a smooth mixture. 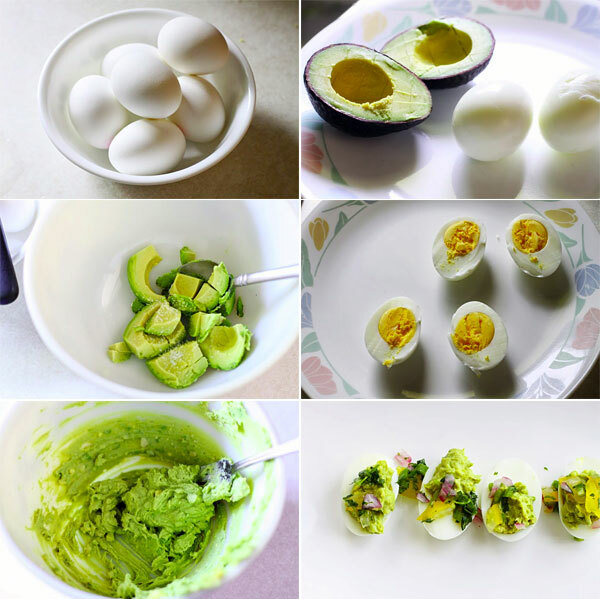 Spoon the avocado mixture into each egg. Shower the eggs with the pico de gallo, and serve. I knew right away she would fall in love with these. She loves a good hard boiled egg in the morning, and heck, the avocado puree, are you kidding me? The pico de gallo added a nice texture to the smoothness of the egg and avocado, and well, let’s just say she loved them. 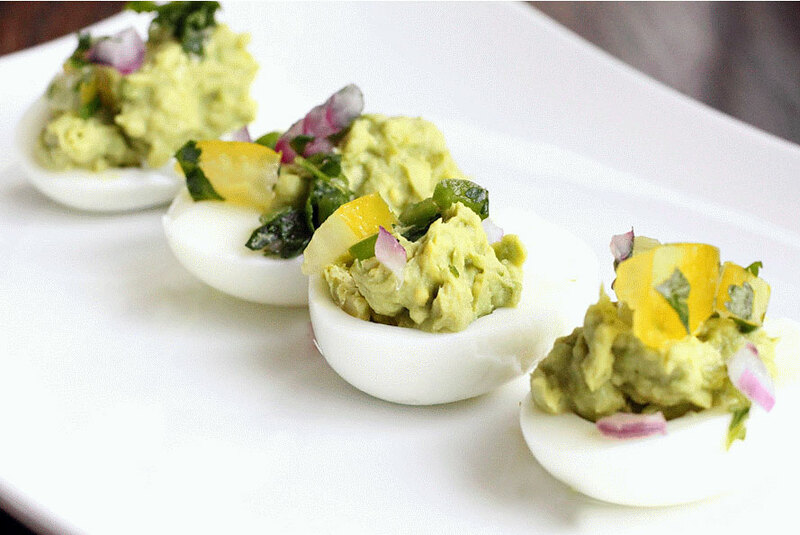 If you are looking for something different to serve for deviled eggs, these avocado deviled eggs were awesome. Give this one a try! Hope you enjoy. A simple deviled egg recipe that is perfect for lunch or snack.